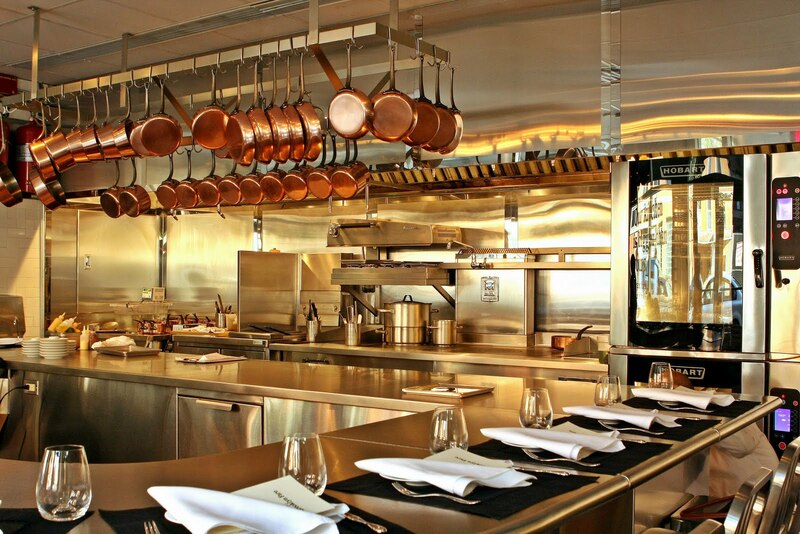 Have you ever heard of the Chef’s Table at Brooklyn Fare? If you are scratching your head now, you are going to thank me later. Brooklyn Fare is a supermarket in Brooklyn. Yes, you heard me correctly…a supermarket. And what better place to dine right? The Chef’s Table is a restaurant a few doors down from the market. The restaurant, which is the only restaurant in Brooklyn with two Michelin Stars, is an intimate, 18-seat space that will take any foodie’s breath away. As the front door opens, you walk into clouds of hanging copper pots that glow from the soft candlelight embroidering the room and you know this must be what heaven looks like. Well, they say it’s a long way to heaven, and boy were they not kidding. I made a reservation in the middle February and the first day they could offer me was a Friday in April. You might be wondering why anyone would wait so long for a reservation. Well, the truth is, that’s the only way to get there. Brooklyn Fare opens the phone for reservations on Monday mornings at 10:00 am. They take reservations for an entire week, six weeks out! Don’t think you can just pick up the phone at 10:04 and get someone to answer, because you will be sadly mistaken. I spent the better part of an hour hitting redial until the dreaded busy signal turned into a melodious ring. Getting the reservation is more than half the battle, but waiting 6 weeks to dine is borderline torture. Thinking about dinner becomes dreaming and before you know it you are fantasizing…it’s like 6 weeks of foreplay and no action. Well, this Bite-Sized Blonde finally got in…and it was worth the wait. This tasting is almost 20 courses, and each bite of food is more delicious than the next. Chef Cesar Ramirez carefully choreographs this menu, so that each course has a more developed flavor profile than the last. The first eight or so courses are canapés, which are perfectly petite at one to two bites each. The canapés are served on unique utensils that make the tasting feel like the most exclusive exhibition. The canapés are followed by several entrees as well as cheese and dessert courses. Out of respect for the Chef, I won’t divulge too many details about the menu; they ask specifically that you do not take notes or use a camera in the dining room! But, Chef Ramirez did make an appearance on food(ography) this week to discuss one of his entrees, so I guess it is “fare game”. The Chef prepares a monkfish so tender and beautiful you think you are dreaming. The monkfish tail is cut into sizeable pieces, as is foie gras. They are both delicately wrapped in napa cabbage and then steamed and served with a white wine and shallot reduction. Now, that’s love. And speaking of love, you must really love food to go to Brooklyn Fare. Dinner will set you back $165/person before tax and service. Oh, and did I mention that it is BYO? Expect to spend $500 a couple here. But hey, can you really put a price on love? Just in case you missed Chef Ramirez on food(ography) Sunday night, you can watch the episode tonight at 9:00 PM on the Cooking Channel. This entry was posted in Restaurant and tagged Brooklyn, Chef's Table, Michelin Star. Bookmark the permalink. Loved the info about the restaurant. I visit NY often and am always looking for wonderful places to eat. Will recommend it to all my NY friends. Sounds like its definitely worth a trip- if you take the right date!!! Great post and so timely!